CarGurus has 3,467 nationwide ATS listings starting at $6,990. The 2016 Cadillac ATS is an improvement over last year's model, especially in upper trims with a more potent, fuel-efficient engine and a better infotainment system. The 2016 Cadillac ATS improves upon last year with a new, 3.6-liter V6 that adds cylinder deactivation and 12 additional horsepower. In addition to the improvements up front, the ATS now sports Apple's CarPlay, which is a viable option for automakers in the future to better serve customers who opt for more infotainment features. The rest of the award-winning car is all there: competent chassis and impeccable road manners. It's enough to give the Germans a run for their money. 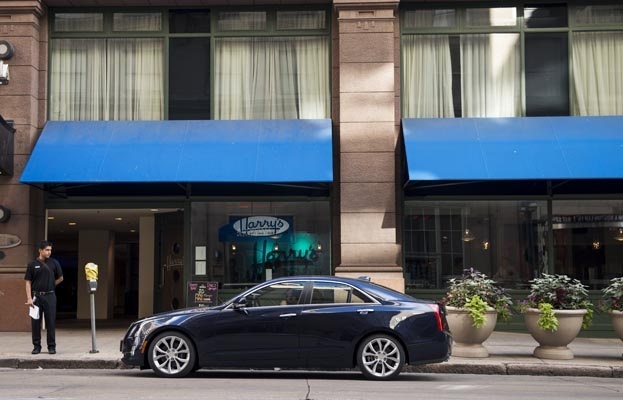 The 2016 Cadillac ATS Sedan is Cadillac’s foray into the compact luxury segment, meant to compete head-to-head with Mercedes-Benz’s C-Class, BMW’s 3 Series, Audi’s A4, and Lexus’ IS cars. The compact rear- or all-wheel drive car is 4 years removed from North American Car of the Year honors and is likely the mold that Cadillac will use for many of its cars for many years. The vaunted “Art and Science” approach to design is present and accounted for in the ATS’s sheet metal. The ATS projects a sharp, angular nose, and its creased bodylines continue down the doors all the way to its poised rear end. The ATS’s athletic stance could be accentuated further in high-performance garb—i.e. flared wheels, splitters, and diffusers—which makes sense after looking at the high-performance ATS-V. As it stands, the ATS is a sharp melody that stands alone in any trim. For 2016, Cadillac added a different 6-cylinder engine and interior features that help bring the car up to completion. 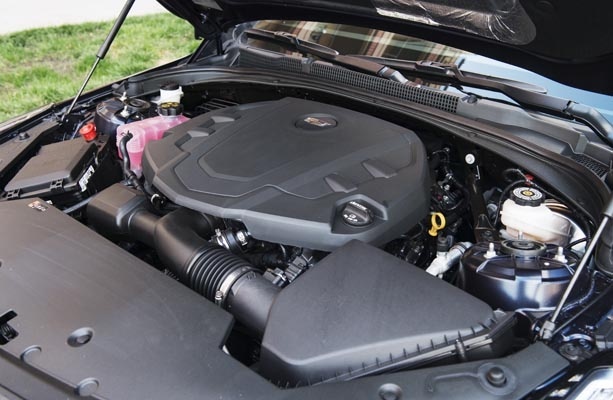 General Motors’ newest generation 3.6-liter 6-cylinder engine, complete with cylinder deactivation for greater fuel economy, makes an appearance in the 2016 ATS. An upgraded infotainment system, including Apple’s CarPlay, makes up the second half of 2016’s improvements over last year. The ATS sedan sports the entire roster of available Cadillac engines. The 2.5-liter 4-cylinder is offered in the base trim, a 2-liter turbocharged four is the midrange, and a 3.6-liter V6 engine tops out the range. The 2.5-liter four comes in Standard or Luxury trims with rear-wheel drive as the only powertrain option. The 2-liter turbo four comes in rear- or front-wheel-drive configuration with Standard, Luxury, Performance, and Premium trims available. The 3.6-liter V6 also comes with rear- or all-wheel drive, but sheds the Standard trim for Luxury, Performance, and Premium packages only. Performance in the luxury compact segment is relative: Most of the entries have high-performance variants with stratospheric levels of performance. The ATS is no different; the ATS-V is a wholly different animal. That shouldn’t take away from the ATS, whose bread and butter has been to offer German competition at domestic prices. For its part, the ATS’s chassis doesn’t let the side down. The compact Caddy remains flat and tight without much of the drama that the others relay. Its ride may not be as compliant as, say, a Lexus IS's, but it’s nowhere near as nervous as a BMW 3 Series can be. 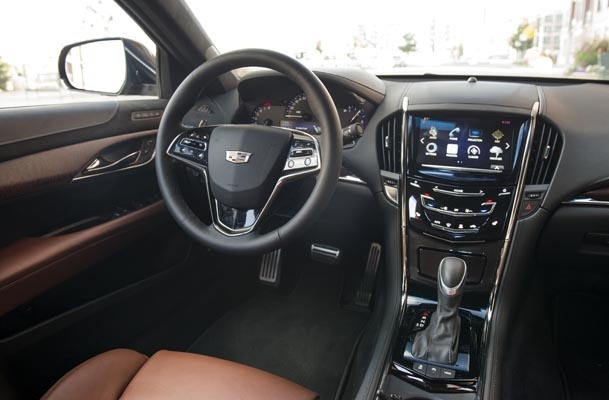 In addition to a superb skeleton, Cadillac includes in its Premium trim Magnetic Ride Control, similar to systems used in Chevrolet Corvettes and Camaros, which transforms the ATS into a road-eating machine. Under the hood, Cadillac mostly follows suit with its German competition—and with similarly mixed results. The 2.5-liter four packs only 202 hp and 191 lb-ft of torque and is hardly a world-beater among its competitive set. The raspy, labored engine is paired to only rear-wheel-drive sedans—the 2.5-liter isn’t available in the coupe or all-wheel-drive variants for good reason. At just $2,030 less than the next step up, it’s best to consider fewer options and a better ride than the budget engine. Fuel economy gains are minimal: the 2.5-liter manages 21 mpg city/ 33 highway, according to the EPA. The second mill, a 2-liter turbocharged four, produces 272 hp and 260 lb-ft of torque. The 70 extra ponies power the ATS sedan up to 60 mph in fewer than 6 seconds and go a long way toward improving overall capability. A force-fed four isn’t wholly unusual—BMW, Mercedes-Benz, and Audi have long offered small-displacement turbocharged engines in their comparable cars with great success. The 2-liter turbo is an excellent compromise—extra power for $6,195 less than a comparably equipped V6, and its fuel-economy returns are comparable to the budget engine: 21/30 for an automatic rear-wheel-drive version, 20/28 with all-wheel drive. If you’re in the mood for power without compromise, the 3.6-liter V6 is ready to tickle your fancy. Its 333 hp and 285 lb-ft of torque may not be numerically enough to justify the extra cost, but its linear power delivery and competent road manners may be. The 3.6-liter V6 shaves only a few tenths off the 0-60 mph time, but throttle response is dramatically different. Fuel economy isn’t terrible either; the 6-cylinder manages 20/30, according to the EPA. All engines are paired to an 8-speed automatic transmission, and in the sedan, only the 2.5-liter four can be mated to a 6-speed manual. The Cadillac ATS trades on its premium feel and sophisticated styling more than most GM cars, and for the most part it succeeds. 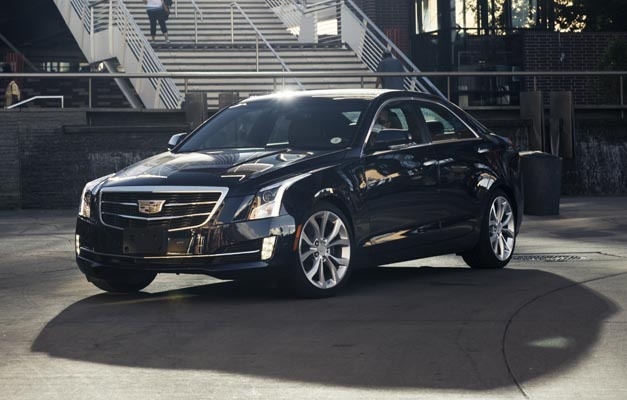 The ATS feels as sharp and composed as many of its rivals and succeeds in challenging the stereotype that Cadillacs are wallowy, soft vehicles. The interior is roomy for driver and passenger, although the rear passengers’ legroom isn’t as accommodating as a much-less-expensive Chevrolet Cruze (33.5 inches vs. 35.4 inches). The rear cargo area isn’t entirely commodious either: Trunk volume is only 10.4 cubic feet, which is less than the 3 Series' 13 cubic feet. Once you’re inside, the ATS is supremely quiet and composed on the road. 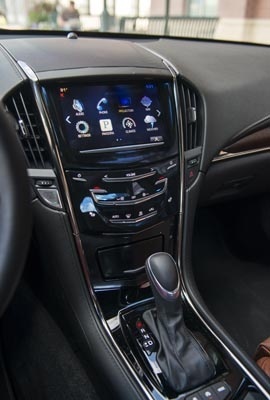 The aforementioned Magnetic Ride Control is a revelation, but even in normal guise, the ATS conveys a special feeling to drivers and passengers—a huge improvement over older Cadillacs. Shod with 17-inch wheels as standard or optional 18-inch wheels, the ATS doesn’t convey much of the drama underneath through to passengers. Far from numb, the ATS is balanced and refined, although a little heavy feeling. The introduction of Apple’s CarPlay goes a long way in making the ATS a better place to be inside. The usability and simplicity of a system that mimics most smartphones on the planet can’t be understated—this is the future for a lot of cars' infotainment systems. Unfortunately, the system isn’t replicated throughout the car. The steering-wheel controls are completely different than the infotainment’s layout and frustratingly confusing. Ditto for anything other than music, maps, messages, or phone calls: Navigating the car’s setup is a wholly different experience. 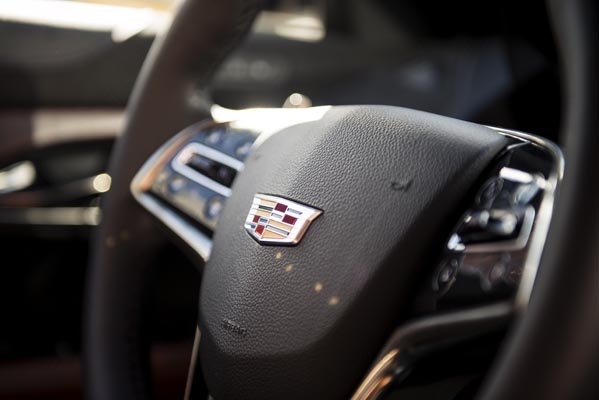 I’d expect most owners to navigate Cadillac’s CUE system with ease after a month of ownership, but the steering-wheel controls will remain fidgety forever. Thankfully, the rest of the ATS’s interior is a more straightforward affair: Storage and cubbies are plentiful, despite being a compact car, and the layout is bespoke for the ATS—it’s not a shrunken version of the CTS. Case in point: Suspension and car-mode setup are tucked below the shifter and not jammed into the dash or around the 8-inch touchscreen. The annoyances? Some of the ATS’s parts are annoyingly budget. The speedometer and tach look like they were salvaged from an old Pontiac, and the hard materials aren’t exactly luxurious. Also, a more spacious back seat would do wonders in the segment. The Cadillac ATS comes standard with active and passive safety features, including airbags, disc brakes, traction control, and antilock braking. The ATS has earned a 5-star overall safety rating from the National Highway Traffic Safety Administration and a Superior rating from the Insurance Institute for Highway Safety. The ATS can be equipped with optional safety equipment, including blind-spot monitoring systems, forward collision alerts, automatic seatbelt tightening, lane-departure warnings, and cross-traffic alerts. A heads-up display is available in Performance and Premium models. As the new kid on the block, Cadillac’s ATS needs to be not only better than the competition, it also needs to be cheaper. Starting at $34,210, the ATS can be had for less money than its German competitors, but like those cars, the more you spend, the better a car you get. Our tester, a 3.6-liter Premium with all the fittings topped out at more than $52,000, which isn’t wholly unusual for the segment. In fact, at a full $17,000 less than the ATS-V, our car was the sneaky performance pick in the ATS lineup. Even at more than $52,000, the ATS feels worth the money. But a few shortcomings such as lackluster lower engines and budget-bin interior parts keep the ATS from leapfrogging the competition. It’s almost there. 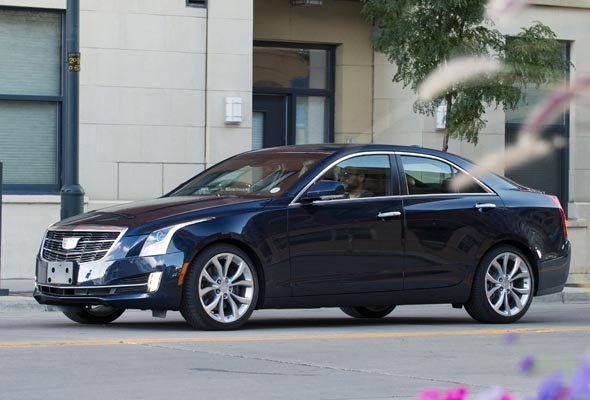 What's your take on the 2016 Cadillac ATS? Oliver The 2.0T now has 295 lb-ft of torque (since 2015) and can also be had with a manual. 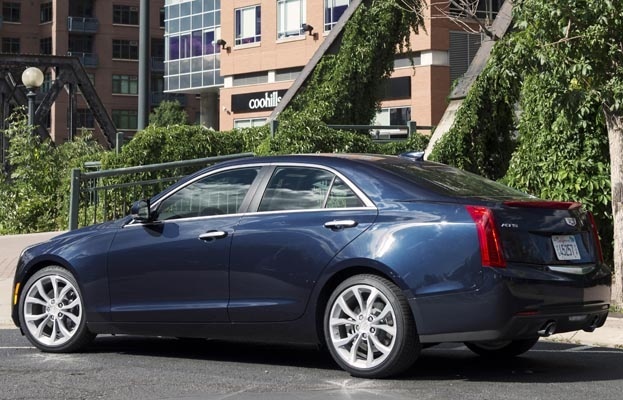 Users ranked 2016 Cadillac ATS against other cars which they drove/owned. Each ranking was based on 9 categories. Here is the summary of top rankings. Have you driven a 2016 Cadillac ATS?